AP Credit Memos can be entered in Restaurant365 to record any credits that are due. 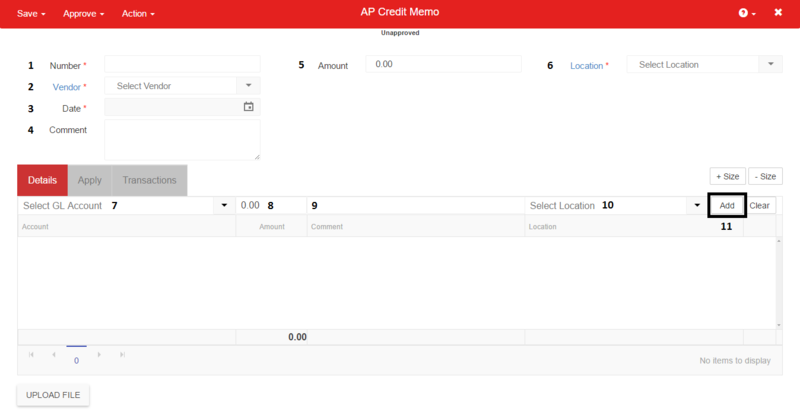 Credit Memos can then be applied to Open AP Invoices. 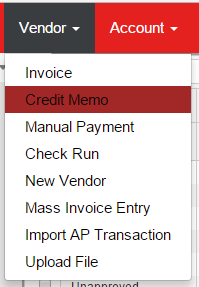 To record an AP Credit Memo, hover over the ‘Vendor’ menu in the top ribbon and select ‘ Credit Memo’. Proceed to enter the line item details in the Details grid. Depending on the Vendor selected, the Details grid will be displayed by Account, or by Item. For Vendors by Account, select the desired GL Account, set the Amount, verify the Location, then click Add. Repeat this process until the full CM Amount is equal to the detail amounts and the Unassigned Amount warning disappears. With all header and detail information entered, the CM is ready to be Saved and Approved. Before Approving the CM, the User has the option of Applying the CM to an Open AP Invoice on the 'Apply' tab. All Open AP Transactions for the selected Vendor will be displayed here. Check the box on the AP Invoice line in the Apply column to apply the CM to the specified invoice. Now that the CM has been applied it is ready to be Saved and Approved.